The newest .300 WinMag M2010 Enhanced Sniper Rifle recently rolled off of the production lines of Remington Defense, marking the end of a programme that began in 2011, and some of the US top snipers where on hand to commemorate the occasion. According to PEO Soldier, snipers Sgt. 1st Class Aaron Welch and Staff Sgt. Seth Spang were joined by Sgt. 1st Class Charles “Chuck” Ledbetter, who teaches long-range shooting in the Special Operations Forces community. 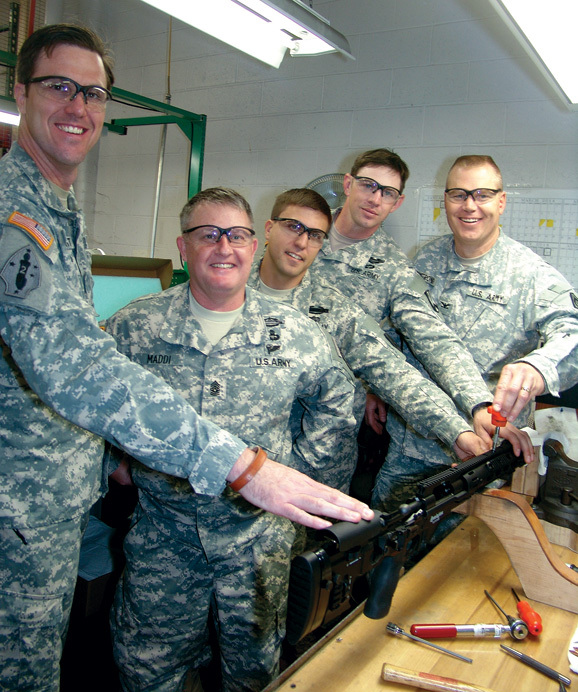 The Army and the manufacturer found it fitting that some of America’s best who had wielded the weapon, participate in the ceremony designed to mark the close of M2010 production. Back in 2011, Welch and Spang were one of the first sniper teams to receive and employ the then new M2010 ESR. Their mission was to “provide relief” for recovery operations at the site of a Chinook crash that had already claimed the lives of American fighters. From their mountain cover position, Welch and Spang rained down deadly accurate fire upon enemy combatants looking to disrupt the mission to bring home the fallen heroes who had made the ultimate sacrifice for their country. For their valor then, and in other missions since, the two were invited to put the “finishing touches” on the last production M2010. That ceremonial weapon is now among the 2,520 systems built to replace the 7.62mm M24 Sniper Weapon Systems, which first entered into the Army and Special Operations Command suite of precision weapon systems back in 1986. The M2010 was created in response to an urgent request for a system with a longer effective range than the M110 and M24 systems they had deployed with. To be more effective in the “ridgeline-to-ridgeline” fight, the Army determined that it could provide a solution quickly by rechambering the 7.62mm M24s’ long-action receivers for .300 WinMag, while also building a fully modern chassis around the receiver. The resulting system provided operators with a 50-percent increase in effective range and a greater precision firing capability. The Army conducted M2010 fielding and new equipment training for all Army Sniper Teams operating in Afghanistan by June 2011, just in time for the Taliban’s summer offensive. By September 2012, the Army had fielded more than 1,400 systems as part of an urgent material release. The M2010 achieved Type Classification-Standard in July 2013 and Full Materiel Release in September 2013, supporting procurement for the balance of the Army requirement.